Come paint watercolours with me in Lucca Italy!! 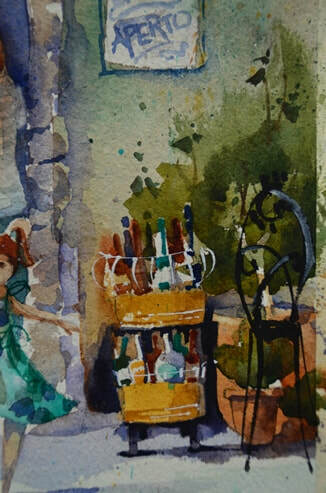 Amanda is an award-winning internationally recognised en plein air watercolour artist, with works held in collections in Italy, UK, Ireland, Canada, USA, New Zealand and Australia. Amanda loves watercolour painting, more than that - it's her life!! She's totally addicted to the chemical reactions produced by the combination of organic watercolour pigments, traditional watercolour papers and water - she loves watching paint dry!! Based in her hometown of Auckland, New Zealand, Amanda also lives in Lucca for her annual painting residency and workshops in Italy. When in Italy, every morning she heads out into the streets of Lucca in search of new and evocative painting subjects to paint en plein air. Bicycle loaded with painting equipment pared to a minimum, an espresso and cornetto (traditional Italian colazione), then off to the next painting location. In conjunction with her Auckland watercolour classes and workshops, Amanda also teaches week-long watercolour painting holiday workshops in Italy for watercolour enthusiasts who want an active holiday and want to get to know a destination intimately. Amanda says "I create paintings that are atmospheric with interesting shapes - almost California Art style - look up Frank Webb, Rex Brandt and my absolute favourite watercolour artist Ted Sherwen. I let colours run into each other creating a unique underpainting and telling my story through a detailed focal area. I want you to be able to see something new every time you look at my paintings." Amanda enjoys painting street scenes en plein air or studio and still-life. "I always add people and crowds to my street scenes, many artists avoid this but I find it exhilarating (frightening!) to add a minimal shape that will become a person. Watercolour is for the minimalist, less is definitely more! I love creating odd funky shapes - they still say 'I'm a bottle or a teapot' but nothing is straight - a long line has a kink or something to destroy it"
painting en plein air Ponte a Serraglio.